It was a crazy volatile week. Nifty Futures done a descent recovery from the attempted downtrend twice in Dec 2017. Every Major 300+ points corrections got bought in December expiry so far. Lets understand the state of the market to get a fresh short term outlook. Nifty on the Daily Charts is in a broader consolidation zone between 10050-10500 range. Nifty is trading very close to the all time high reference levels 10530. Trading sentiments holds positive for the past 6 consecutive trading session. Interestingly Put writers are over aggressive for this series whenever price reached above 10400 for this series. Too much of put writing indicates over confidence not a healthy situation for the continuation of the trend. Sideways action is expected to continue for next week as holiday season is approaching where volume is likely to be be thin as institutional players are likely to be less active and so the long term money commitment. Market Internals are holding moderately positive with too much of put writing. 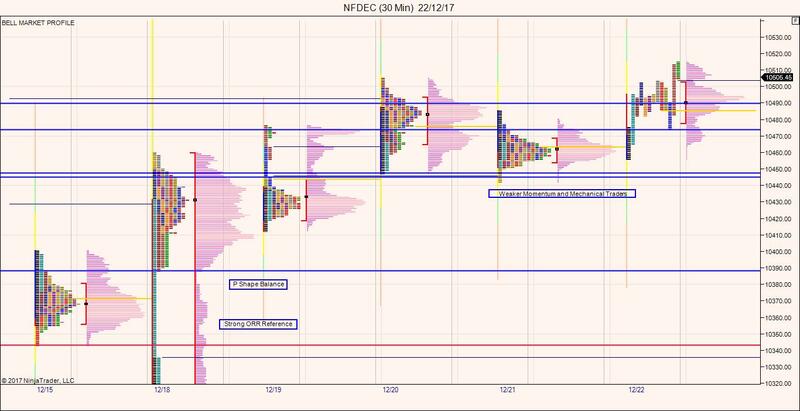 Nifty futures on friday session opened within the range and immediately pulled towards the 10500 zone rest other day balanced in 10475-10505 range with value formation higher. Structure wise profile is indicating short term longs inventory went long to too long hence possible inventory correction can be expected in this scenario. For any shortterm view to turn towards negative bias an acceptance below the Friday pullback low 10473 will change the scenario to downtrend. Weaker momentum buying is witnessed in the last four trading sessions around 10448 reference it is typical laggard weaker momentum traders behavior Post the election results. Strong Support zone for this series expected around 10342 – 10388 reference. As long the price holds above 10342 – 10388 medium term bullishness persist. Price breaching the band might bring 10100 levels and possibly newer lows again.